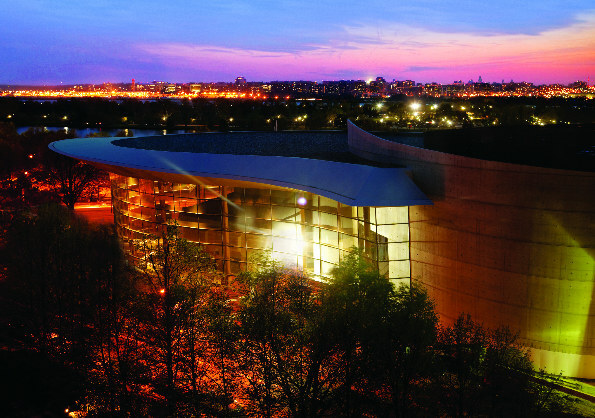 Performing Arts: Arena Stage Throws Open its Doors Washington's acclaimed and beloved Arena Stage has thrown open its doors for the business of theatre at its new Mead Center for American Theater on the Southwest DC Waterfront. 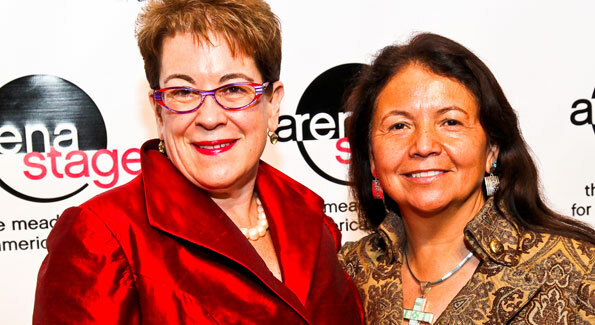 Arena Stage's Female Force Arena Stage will reopen in the new Mead Center for American Theater in fall 2010, thanks to some of Washington’s most forward-thinking women. In an electrifying climax to a 10-year journey of renewal and reconstruction for DC’s acclaimed and beloved Arena Stage, the doors were finally thrown open for business of theatre Oct. 24 at the Mead Center for American Theater, as 550 tuxedo-clad patrons paying up to $2,500 per seat poured into the stunning new performing arts complex astride the Potomac River in Southwest D.C.
As a follow-on event to Arena’s very successful Homecoming Grand Opening Celebration two days before, in which 10,000 members of the public got their first peek at the $135 million facility, the Opening Gala Celebration was a decidely black-tie affair full of loads of sparkle, klieg lights and starpower. The gala kicked off the inaugural season at the new Mead Center, pouring a needed $1.25 million into Arena’s coffers just days after round-the-clock construction crews finally begged off last week after putting the final touches on the sweeping, airy complex, the biggest theatre opening in the Nation’s Capital since the John F. Kennedy Center for the Performing Arts opened in 1971. “Tonight’s proceeds support all of Arena Stage’s programs, including the exciting work on our stages, our investment in new play development and our wide range of community engagement activities,” said Arena’s Managing Director Edgar Dobie. The evening featured red carpet arrivals, tours of the building and cocktail reception, followed by a seated dinner and an exclusive one-night-only performance featuring Alice Ripley and The Manzari Brothers, and headlined by Tony Award-winning Broadway actor Brian Stokes Mitchell. Leon Harris, the award-winning journalist and ABC7’s lead anchor, emceed the evening. Arena opens its inaugural season with a classic American musical that similarly embraces life on a new frontier. Rodgers and Hammerstein’s Oklahoma! is the first production at the Mead Center and features an all-star cast under Smith’s artistic direction. The play runs until Dec. 26 in the Fichandler Stage. Smith sets her production in the robust world of territory life filled with a dynamic cast as rich and complex as the tapestry of America itself. D.C. area favorite E. Faye Butler (Arena Stage’s Crowns, Ain’t Misbehavin’) stars as Aunt Eller. Arena Stage was forced to cancel the preview performance of Oklahoma! due to the departure of actress Valisia LeKae, who withdrew from the production due to pressing personal matters. She has been replaced by Helen Hayes Award winner Eleasha Gamble, who was last seen at Arena Stage in The Women of Brewster Place and recently portrayed Svetlana in Signature Theatre’s production of Chess. Butler and Gamble are joined on stage by Aaron Ramey as Jud and by Nicholas Rodriguez as Curly, who played Fabrizio last season in The Light in the Piazza, also directed by Smith. Cody Williams makes his Arena Stage debut as Will Parker alongside June Schreiner as Ado Annie Carnes, a high school junior at The Madeira School in McLean, VA, who was discovered in last summer’s Arena Stage Academy Musical Theater Training Company. With Rodgers and Hammerstein’s timeless music, Molly Smith’s version of Oklahoma! celebrates the vigor of America’s pioneering spirit with athletic dance and boot-stomping energy. As the first modern musical to use music and dance as an integral part of the plot, Smith’s Oklahoma! is also a collaboration between Music Director George Fulginiti-Shakar and Choreographer Parker Esse. Further complimenting the production, Smith has commissioned Tony Award-winning designers Eugene Lee and Martin Pakledinaz to develop dynamic sets and costumes respectively that bring the rough-hewn Oklahoma to life. Tickets for Rodgers & Hammerstein’s Oklahoma! start at $45. Arena has made its new perch tucked into a corner of Southwest D.C. accessible to theatregoer. It is accessible via Metro’s Green Line, at the Waterfront-SEU station at M and 6th Streets, SW, and a new garage has been built off Maine Ave. SW, which is available by reservation to full-season subscribers for $18 per show. Remaining spaces are $20 for non-subscribers, but theatregoers can also park at either of Central Parking’s garages on 4th St. between I and M Streets for $10. Smith said that Arena is committed to commissioning and developing new plays through the American Voices New Play Institute. While President Barack Obama and First Lady Michelle Obama were no shows at the opening gala, they lent their names as honorary chairs of the gala and also of Arena’s inaugural season at the Mead Center, which kicks off with “Oklahoma!” The evening’s other two co-chairs, D.C. Mayor Adrian Fenty and Michelle Fenty, were present, and appeared just as awe-struck as the evening’s other guests by the wonder of Arena’s triumphant new theatre space. The presenting table sponsors for the evening were Clark Construction and The Clark Charitable Foundation. Lead table sponsors were the Waterfront Station, Vornado Charles E. Smith, Pepco and Altria. On Oct. 22, the Mead Center officially opened to the public with a Homecoming Grand Opening Celebration, a day of free events and backstage tours which kicked off with a ribbon cutting. The ceremony was followed up by festivities throughout the building featuring Broadway and Tony Award-winning stars, conversations with prominent Arena Stage artists and presentations by local arts groups. On the outdoor stage, Universes performed word/slam poetry ensembles, students from Chantilly and Churchill High Schools performed show choirs and The Manzari Brothers, Elk Soldiers and Feel So Good dazzled the crowds with their theatrical ensembles. In the end, the cast of Oklahoma! stepped on to the stage to perform the grand finale. At the Fichandler Stage, Arena hosted sneak previews all afternoon of the inaugural production of Rodgers and Hammerstein’s Oklahoma! while at the Kreeger Theater there were back-to-back concert performances by E. Faye Butler (The Women of Brewster Place); Brad Oscar (Tony Award nominee for The Producers, Arena’s Cabaret), Kate Baldwin (Tony Award nominee for Finian’s Rainbow, Arena’s South Pacific), Matt Bogart (Broadway’s Jersey Boys, Arena’s Damn Yankees) and Alice Ripley, the Tony Award winner for Next to Normal. At the Kogod Cradle, a theatre designed to explore the newest theatrical works, Resident Playwrights Karen Zacarías and Katori Hall read from their new projects, Anna Deavere Smith discussed her newest piece, Let Me Down Easy, and Resident Playwright Amy Freed held a conversation with The Washington Post’s theatre critic Peter Marks. Playwright Marcus Gardley and members of the company of every tongue confess discussed their new play, and Resident Playwright and Duke Ellington’s Sophisticated Ladies director Charles Randolph-Wright read from his new work. Local performing groups like the Washington Improv Theater, Synetic Theater and the Liz Lerman Dance Exchange also rehearsed for crowds, while longtime Arena Stage favorites like Diego Prieto, Eleasha Gamble, Nina Negri, Bayla Whitten, Tina Fabrique, Marva Hicks and Stephen Wade performed cabaret. The cafe in the Mead Center, operated by José Andrés Catering with Ridgewells, is open all day. José Andrés Catering with Ridgewells offers creative cuisines, similar to those found in Andrés’ restaurants Jaleo, Zaytinya, Oyamel, Café Atlántico and the critically acclaimed Minibar by José Andrés. The Mead Center for American Theater, designed by Canadian architect Bing Thom, has been under construction for the past three years, during which Arena Stage presented season productions in temporary locations in Crystal City and at the Lincoln Theatre on U St., NW. The planning and building of this theater complex has been a catalyst for community-wide revitalization in Southwest D.C. New restaurants and commercial retailers have already moved into the Southwest neighborhood. “This celebration marks the beginning of a new era for Arena Stage, further establishing itself as a national center for the production, presentation, development and study of American theater,” Smith said.